Losing your hair and going to be bald are different things. Male pattern baldness is a genetic condition in males on the other hand hair loss can be caused due to various factors. If you are losing plenty of hair in an apparently random manner you may have alopecia. Alopecia is a condition where a person (male or female) loses a large amount of hair from parts of their body. In utmost cases, this may affect all of the hair on the body. Alopecia is thought to have hereditary and autoimmune factors (where the body mistakenly attacks itself). It is not the same as male pattern baldness. 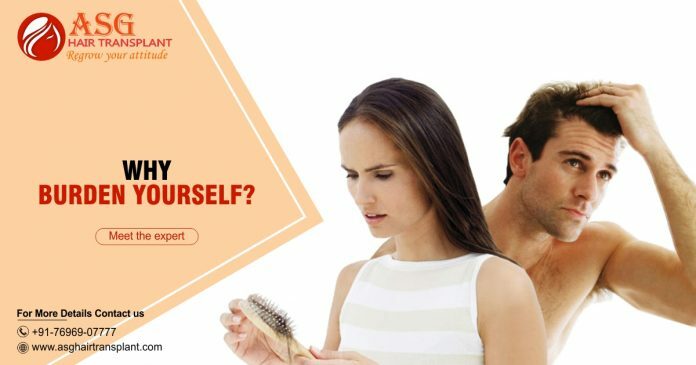 If your hair losses in a more regular pattern, normally from the temples and crown of the head, then it is likely to have male pattern baldness. Hair loss in males starts at some point near by twenties, but it normally takes 15-25 years to go bald. Half of the fifty-year-olds are quite bald. For very rare cases men go bald in less than five years. Hair loss is mainly due to a long illness or any surgical process. Stressful lifestyle, changes in hormone levels and infection in scalp also considered as reasons for hair loss. Baldness is a natural process. For the purpose of treatment, there are two drugs that can help. 1) Minoxidil lotion: Minoxidil lotion is an FDA authorized the latest treatment to treat male pattern baldness. It affects the hair follicles to grow and used directly onto your scalp for results. 2)Finasteride: It is more effective than minoxidil. It is an oral pill, it binding to the enzyme. Previous articleI am ASG’s number one fan!